It may be true that British tabloids are more prone to titillation than to solid reporting. Yet, the Daily Mail’s piece today requires some real scrutiny and should cause concern for all who flip on a light switch each day. Ellie Zolfagharifard’s article, “Giant sunspot aligns with Earth – and it could create huge flares that would wreak havoc on our power grids and satellites” is posted here. 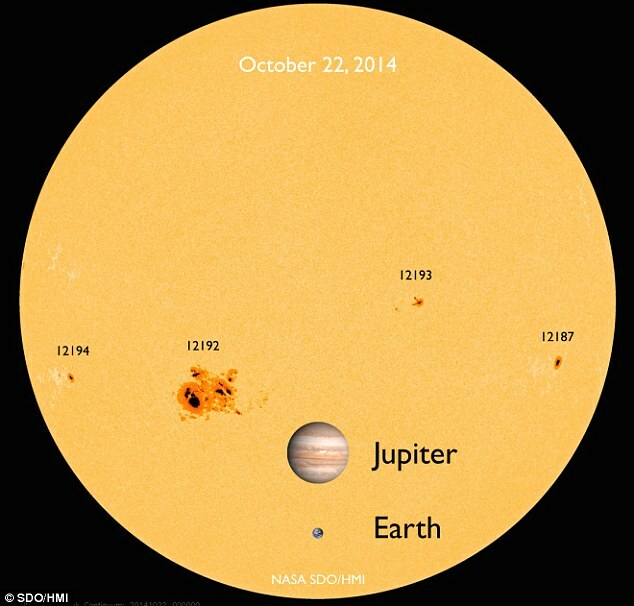 > Sunspot AR 12192 is now facing the earth. > It is likely to create CMEs. > AR 12192 is the largest in 24 years (it’s the size of Jupiter). > “The largest ever solar super-storm on record occurred in 1859 (Carrington Event)”. > It released “the equivalent to 10 billion Hiroshima bombs” in energy. > “Solar super-storms pose a catastrophic and long-lasting threat to life on Earth,” says Ashley Dale, Doctoral Candidate and member of Solarmax (an international task force). > Nasa scientists have predicted that the Earth is in the path of a Carrington-level event every 150 years on average. This means that we are currently five years overdue – the likelihood of one occurring in the next decade is as high as 12 per cent. Will AR 12192 create another Carrington-sized super-storm? No one really knows. However, it is one more in the now long line of warnings being highlighted by main stream media about the potential of a solar apocalypse. When we are warned over and over again by multiple sources of a pending calamity, and we do nothing to protect ourselves, what does that say about us? Please let this be our clarion call. The science is solid and cannot be ignored. We must protect our American power grid and we must personally prepare our homes for the worst case scenario. If you read the headlines the last few months, you cannot help but be a little worried. But does this mean we are headed towards a solar apocalypse or end-of-the-world scenario like the one we’ve been warning about? Yes, I’m afraid it does. Please let my words sink in for a minute and then consider this. If we simply have an event that mimics the size and scope of the Carrington Event, that occurred 150 years ago, 50% of us, the world’s tenants, will have no power and water to our homes for maybe months or years (the other 50% doesn’t have these already); most every automobile and airplane will be non-functional; many of our smart devices and electronics will be made inert; and much of our storehouses of data (i.e. banking, internet, etc.) will be gone. Imagine what life would be like? Well it could get worse than this. 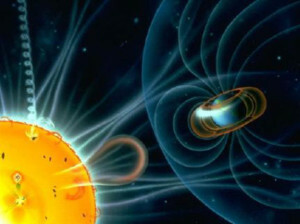 Solar Storms have been ravaging our upper atmosphere since the sun emitted radiation, but our earth has been protecting us with a magnetic shield since before man took his first steps. What if that magnetic shield were damaged or were to deteriorate as some scientists and at least one sci-fi author has posited? It could mean the end of us all. I’m not writing this as a Halloween scare tactic, but to have you consider the tenuous footing we are all on right now. We don’t have to go as far as the scenario chronicled in DESOLATION; just consider the replication of an event that has already happened. What can we do? Plenty! First, contact your federal government officials and have them commit to spending on shielding the grid. There are two bills stalled in Congress that address some of our grid’s deficiencies. A few $ billion is all it will take to add enough protection to insure that the down time, in the event of another Carrington Event, is days or weeks and not months or years. Next, prepare for the worst. There are many actions you can take for your family to prepare for the worst case, even if it isn’t that bad. Just consider, could you survive without any utilities (power, water, phone, internet) for weeks? If not, then start now to prepare to do so. Start immediately to store up three or four weeks of food and water. You can get more tips on preparing by downloading our free Solar Apocalypse Survival Guide. I’m asked often, when will this happen? Unfortunately, there is no way to know this. We will continue to study the data and report back to you. But, until that day when we will announce, the next Carrington Event is coming, prepare for the worst. It is coming. What a difference a week makes. Only one week separated us from the normal daily existence we enjoy today, to one where you wouldn’t reading this because we would be foraging for food and struggling for survival: Armageddon, plucked from the pages of the novel STONE AGE by ML Banner would have happened. Over the past few weeks, mainstream news has uncovered what we reported long ago; that the worst solar storm in recorded history missed the Earth by just one week. In other words, on July 22nd, 2012, two massive coronal mass ejections or CMEs were emitted, the combination of the two struck the exact orbital path the Earth traveled, but missed our world by a week: if the sun had emitted these CMEs only seven days sooner, it would have struck the Earth with more power than the Carrington Event of 1859. Power grid down for years, maybe decades. No power means no water, no communications, no internet, no manufacturing, no delivery of supplies, and so on. Just about anything that has a computer or small circuit, will be overloaded & damaged by the induced current from the solar storm. Massive fires will erupt everywhere there is an excessive amount of conductive material: transmission lines, railroad tracks, buildings, electrical wiring, etc. Besides a worldwide economic collapse, we would have mass starvation in all the urban centers within two weeks. Mass death from violence and disease would add to the desolation our world would experience. Yesterday, the billionaire manager of a multi-billion dollar hedge fund and then Bill O’Reilly of Fox News, among many others, jumped on the “I’m getting freeked out” band wagon. We’ll I say, it’s about time! Whew, were off the hook now, right? Wrong! We’ve been predicting between a 10% to 20% chance of a Carrington Event occurring in the next decade. So, consider this the warning shot. 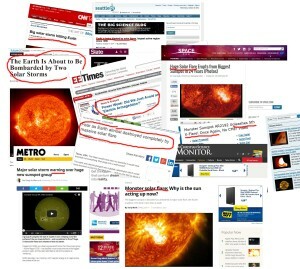 Truth is we may get ten of these types of solar flares over the next ten years or none. There is just no way to know for sure. However, we do know it will happen again. So, if it happens, we’d just replace the transformers, right? Sure, this sounds easy, but the truth is that each of the 4400 major transformers that make up our power grid cost several $million each and take up to two years each to manufacture and install, and that’s when the power is on. Further, most manufacturers are located outside of the US. You would needto ship each to the US, which again will be difficult considering the state of the world’s power, electronics, transportation, etc. Okay, I’m not one to belabor the coulda-shoulda-woulda thinking. If it happens right now, we’re screwed. And because we can be pretty sure that it will happen at some point in the future, we need to take action now! We can shield all 4400 major transformers, so that the downtime would be maybe days rather than years or decades. Yes, there would still be pain and misfortune because of this, but we would have the power back on in a reasonable amount of time and most of our population would survive. So, why doesn’t this happen? Simple, our government does not have the political courage to take action. Our American politicians would rather fund a questionable science like anthropogenic global warming, now called “climate change”, rather than an event that is far more likely and would be far more devastating to our way of life. The cost to do this would be on the order of $200 billion. But, it could be done over a ten year period and then we could probably withstand whatever our sun shoots our way. This has already been proposed as a bill, called the Shield Act HR 2417, but it has only been introduced in the House, where it remains stalled today. Call your representatives and ask them why they don’t think this is important. Get off the grid – This may not be possible because of zoning regulations, but you certainly can go solar. Make sure you have access to fresh water (assume no power to pump). Store Other supplies for a minimum of one year. Get out of Dodge – well out of Manhattan or LA, etc. You don’t want to be in an urban center if this happens. Have a bug-out location. If you cannot or do not want to leave the city, have an alternative “bug-out” location you can go to. Learn skills – Learn some basics: how to hunt, shoot, farm, holistic medicine, basic paramedics, etc. For more information on how to prepare for a CME event, download our free Solar Apocalypse Survival Guide. So, what are you going to do after reading this? Are you just going to change the channel and ignore this, or are you going to take action while it is in the news and fresh on our minds? Call your representatives in the House and the Senate and get prepared. 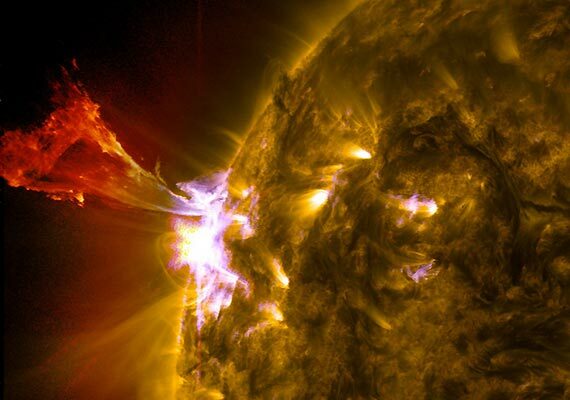 The sun has been especially active the last few days, unleashing three powerful X-class solar flares. If you will recall from earlier posts, X-class are the largest solar flares and are at least 10,000 times more powerful than normal background flares. 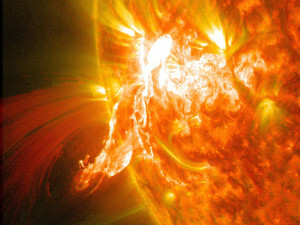 An X1.0 was released on June 10 and then on June 11th, X1.5 and X2.2 (twice as powerful as the X1.0) flares erupted. The X1.0 on 6/10 did not produce a CME, but at least one CME did come from the X2.2 and may hit Earth today. This is not the killer, Carrington-Event type flare we have been warning everyone to watch out for. Although, this will most likely cause radio signal disruptions and the CME will result in more auroras and problems for some of our satellites. However, these X-class flares were mostly erupted away from the Earth, and they were still substantially less than the Carrington Fare, which was believed to be an X22, or twenty-two times greater than an X1.0 flare. As the sun rotates, it could shoot off more flares, more directly pointed toward Earth. There is no better time then now to prepare for the worst. If another Carrington Event were to hit our Earth today, would you be ready? Download a free guide that tells you how. In the mean time, we will keep watching. It took last year’s terrorist attack, to bring a small part of the vulnerability of our power grid to light. As the president of the only US manufacturer of transformers recently said, “we’ve always known that with a couple dollar bullets, you can take out a transformer worth millions of dollars.” Just about every expert agrees that an attack on just a few of the nation’s 2000 major transformers could easily bring down a moderate portion of the American power grid for weeks, maybe even months. What about the natural events, instead of the man-made, which threaten not just a moderate portion, but the entire American grid? We have been among the small few warning that a solar attack, such as the one which already occurred over 150 years ago, would cripple our entire American power grid for years, maybe permanently! Only preventative protection now, can protect us from an event, which could happen any day, and would take our entire country or world back to the technological Stone Age. Yesterday’s front page of the Wall Street Journal reported, “Transformers Expose Limits in Securing Power Grid.” The Journal’s Rebecca Smith pointed out, “the glue that holds the grid together is a network of transformers, the hulking gray boxes of steel and copper that weigh up to 800,000 pounds and make it possible to move power long distances.” Because these giant 400,000 pound boxes are supposed to last 40 to 50 years, few companies world-wide manufacture them, much less in the US. As Ms. Smith explains the problem with replacing just one transformer in our power grid is both time consuming and expensive, taking upwards of two years to manufacture to order, deliver, install and bring online, at a cost of up to $8 million. Imagine trying to replace all of them after being damaged, and without power or delivery systems to do so? Just how bad would it be? A Congressional EMP Commission report warned that within 12 months of a catastrophic EMP event (man-made or natural), some 66% to 90% of the entire U.S. population, more than 200 million Americans, would die from starvation, disease and societal collapse. A repeat of the Carrington-Event would not take out the American and every other nation’s ability to produce power, but potentially all other technology that relies on electricity: utilities, communications, delivery systems, health care, food processing & manufacturing, and entertainment. With the worst case scenario, all our iPhones are gone for a very long time. The logical conclusion is we need to protect ourselves and our grid. 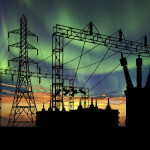 What would it take to protect the grid from a solar attack, which is imminent? At a minimum, $200 million, to protect the 300 most critical transformers, based on the bipartisan Congressional EMP Commission’s report. In Congress, the SHIELD (Secure High-Voltage Infrastructure for Electricity from Lethal Damage) Act was passed last year, to do just this, but is held up in the Senate from the usual political bickering. Perhaps we need to speak louder? What do we need to protect ourselves? We have to each become more self-reliant and not plan on protection from our federal and state governments. Preppers call this going off-grid. But, even more is needed, “Make sure that you have enough food, water, and resources to survive for upwards of a year or longer, is a minimum.” warns ML Banner, the author of a new fictional novel called Stone Age. Yes, another Carrington-type event will occur, perhaps any day now, and yes our way of life would be changed inexorably. What is less certain is what we do as a nation and as individuals to protect ourselves from the devastation and loss of life that will happen. It is up to each of us now to take action. Can magnetic storms cause earthquakes too? We have been preaching about the dangers of large solar storms and related coronal mass ejections and their effects on our power grid, telecommunications satellites, on astronauts in the International Space Station and even the health of people on Earth. But did you know that solar storms may actually lead to earthquakes? According to Namig Jalilov of the Astrophysical Observatory, the last solar generated magnetic storm, from the flare we reported on three days ago,. did not cause any technical failures, but it did affect people with high blood pressure and related diseases. 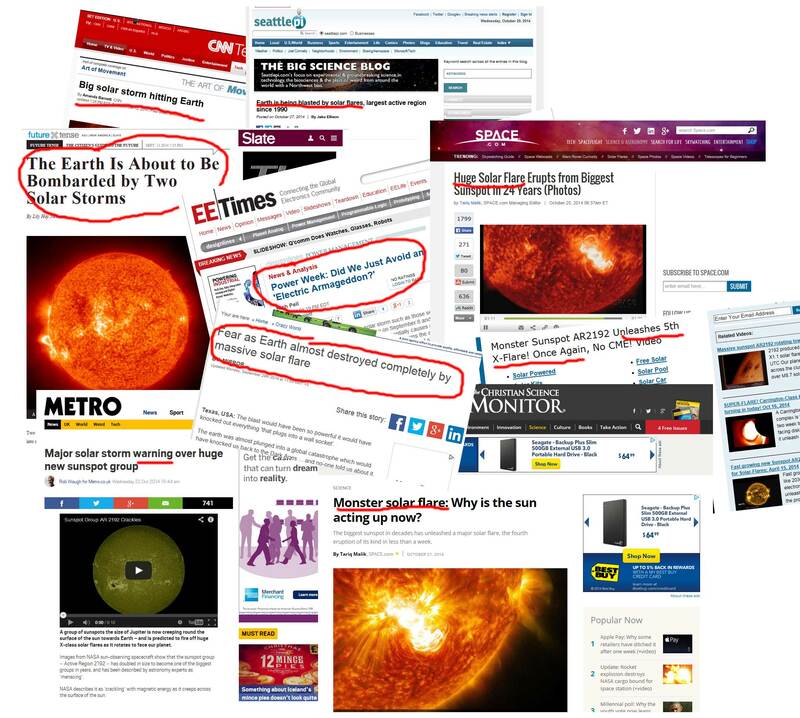 The relation to solar flares & CMEs to human health is widely known. Ironically, the same news organization published later today another article stating that the earthquake on 2/10 near Baku, posited to be related to solar flares, is baseless. The bottom line is that scientists just do not know! But there are suspicions that magnetic field disruptions due to excessive CMEs may be affecting the Earth in unique, but deleterious ways. We will provide you updates as we learn more on this issue. Thank you! there is a moderate to slight chance for an X-class flare from 2/14 through 2/16. This activity is associated with the anticipated arrival of multiple CMEs first observed on 2/11 & 2/12. Although quite active for the past few weeks, the sun’s geomagnetic activity has be quiet for the past 24 hours. It is expected to continue to be active intermittently over the next 30 days per this report. What does all this mean to us here on Earth? If the sun launches an X-class solar flare, we might find accompanying larger CME activity. However, most scientists are not predicting this. At a minimum, we are looking at satellite and radio communication disruptions, and some radiation worries for high altitude aircraft as well as the ISS. I am however more concerned with the unbalanced nature of the sun’s sunspot & geomagnetic activity with both maybe precursors to a much larger event (see Carrington Flare) of the kind we have feared. We will continue to update you as we know more. On last night’s Judge Jeanine program on Fox News Channel, Judge Jeanine Pirro discussed the potential crisis “a million times worse than what happened on 911.” That is the US Power Grid going down due to a solar flare similar to the one that occurred in 1859. Finally, some mainstream warnings about this potential problem.